I thought I would include two photos for this day. It's that time of year when cycle shows take place. Some folks will have been at Interbike in Las Vegas, and Eurobike in Friedrichshafen, Germany. This is the UK version of those shows. 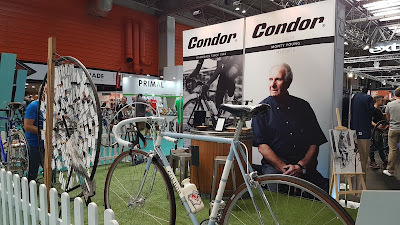 The thing with the Cycle Show at the NEC Birmingham is that it is still of a manageable size where it is possible to get round and easily meet up with the folks that you would like see. It was good to catch up with Claire Beaumont, marketing manager at Condor Cycles. The firm hasn't had the easiest of times this summer, with disbanding of the team they were sponsoring, JLT-Condor, and also the passing away of their founder, Monty Young. On the stand at the show there was a memorial garden, which was a nice touch. Across the way from Condor, were Primal. I have a real penchant for their clothes. I just love the colours. So I had to get some of their socks, to go with the zany arm warmers and jerseys of theirs that I wear. And while I was at it, why not throw in some food. 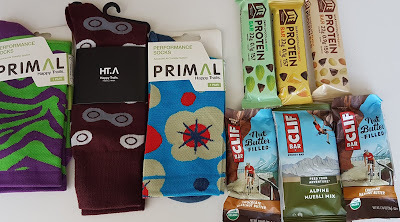 Clif Bars had out some new flavours based around chocolate and peanut - my two favourite things - so there was no way I could pass on that either. Of course, I did do other constructive stuff, like meeting with Canyon and Cube about reviewing their bikes, and interviewing Kirsten Wild about her road racing season and her goals for next year. So it was a productive day, even with the little shopping spree!